I was asked to transform a flat very overgrown garden into a vegetable plot complete with chicken run in Portreath, Cornwall. This was a very exciting project for me and my first major landscaping commission. Initially I had to clear the garden, then I set about making six large raised vegetable beds, a bespoke 'shabby chic' style chicken coop complete with its own hanging flower baskets and stained glass window. Finally I made a picket fence to separate the two. I quickly came to realise chickens and vegetables do not mix! 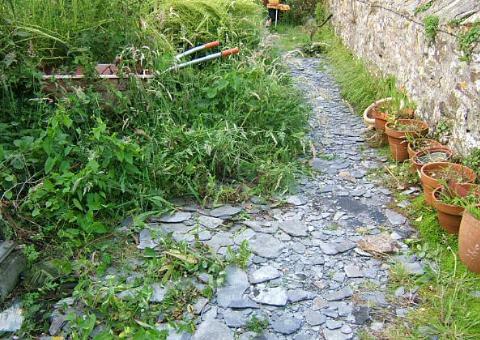 I regularly maintained this garden, which was a really satisfying experience. I believe my love of gardening came from this opportunity.